CicLAvia, Planning 101, High-Speed Rail, Boring Company tunnel, Peddler’s Creamery and more. As of yesterday 4/15 and for six months through 10/15 – Above Los Feliz Boulevard, the L.A. River bike path is closed for construction of a new multi-modal bridge next to North Atwater Park. Cyclists are expected to detour through Griffith Park. Details at construction notice. Monday 4/16 – Tonight, the L.A. City Planning Department continues its series of Planning 101 Trainings intended to provide an overview of the basic elements of the City’s development process and key points for public participation. Tonight, Planning 101 takes place from 6-8:30 p.m. at Granada Hills Charter High School at 10535 Zelzah Avenue. Meetings continue at various locations next week through Wednesday 5/2. RSVP and additional details at Planning website. See also event flier. Tuesday 4/17 – The board of the California High-Speed Rail Authority will host its monthly board meeting in Southern California, a somewhat rare event. The board meeting starts at 10 a.m. at the Metropolitan Water District Board Room, 700 N. Alameda Street in downtown L.A., immediately adjacent to Union Station. In the past, HSR opponents (which are all too common in Southern California) have attended to criticize the project. Meeting agenda and supporting materials at CAHSRA website. Wednesday 4/18 – A Koretz motion for Elon Musk’s Boring Company’s “proof of concept” tunnel is on the agenda for the L.A. City Council Public Works Committee meeting at 1 p.m. at City Hall, Room 350, 200 N. Spring Street (public entrance on Main Street) in downtown L.A. The motion would allow the three-mile tunnel – underneath Sepulveda Blvd – to proceed with an exemption from environmental studies. Details at meeting agenda. Thursday 4/19 – Sustainable Little Tokyo and Little Tokyo Community Council will host a community forum on the planned West Santa Ana Branch light rail project. The meeting will take place from 6:30-8 p.m. at the Japanese American Cultural & Community Center at 244 S. San Pedro Street. Details at Facebook event. Saturday 4/21 – DTLA’s bicycle-powered ice cream shop Peddler’s Creamery will celebrate its 5th Anniversary with a “Pedal Party.” The event takes place from noon until 7 p.m. at Peddler’s Creamery at 458 S. Main Street in downtown Los Angeles. Details at Facebook event. Sunday 4/22 – This Sunday is Earth Day. Metro is offering free rides all day on buses and rail. 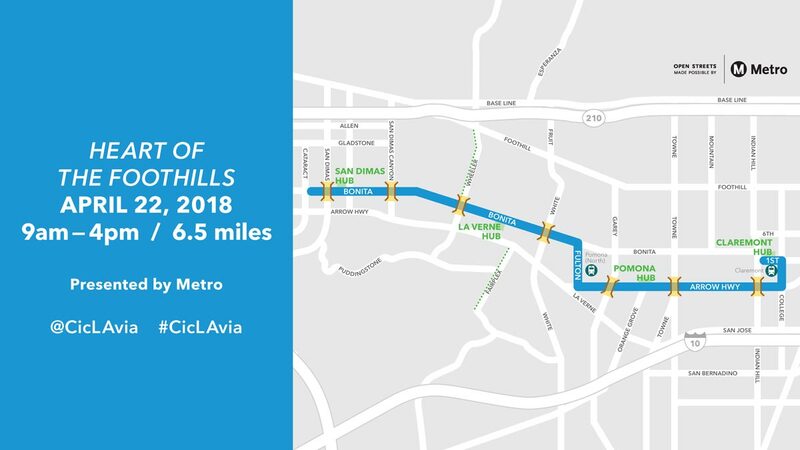 Sunday 4/22 – CicLAvia “Heart of the Foothills” arrives in the east San Gabriel Valley cities of San Dimas, La Verne, Pomona, and Claremont. The 6.5-mile free family-friendly street festival is open to walking, wheelchairs, skating, and bicycling. Streets are open from 9 a.m. to 4 p.m. The route is 7 miles from the APU Citrus Gold Line terminus station, and is easily accessed via Pomona (north) and Claremont Metrolink stations. Event details at CicLAvia website. Bike SGV/Eastside Bike Club/Stan’s Bike Shop will host a feeder ride from Azusa. Next week: Thursday 4/26 – Metro, L.A. County, and the Crenshaw Chamber of Commerce invite stakeholders to attend either of two community workshops to discuss the proposed housing, community space, and retail development planned at the intersection of Exposition and Crenshaw Boulevards. The second workshop will take place Thursday from 6:30-8:30 p.m. at West Angeles Church, Crystal Room, at 2045 Crenshaw Boulevard. Details and RSVP at event registration website.